This is a friendly reminder for Shrabon Sandhya on July 28th at Sanatan Dharma Temple from 6pm onwards with guest artist, Sagnik Sen. This event is free for members/sponsors and the suggested donation otherwise is $20/individual, $35/couple, and $40/family. Please RSVP by July 25th to help us and the food committee plan accordingly. A classical ensemble program, under the able guidance of Mr. Suman Laha, is being organized as a postlude to Mahishasura Mardini on Saturday October 6th. This ensemble will feature vocal and instrumental (tabla, sitar, guitar, sarod, violin, and flute) pieces. Those interested in participating, please click here. We are so proud of our Dakshini members who are out there promoting our culture in one way or the other! Bharat Sevashram Sangha celebrated Ratha Yatra on Saturday July 14th. 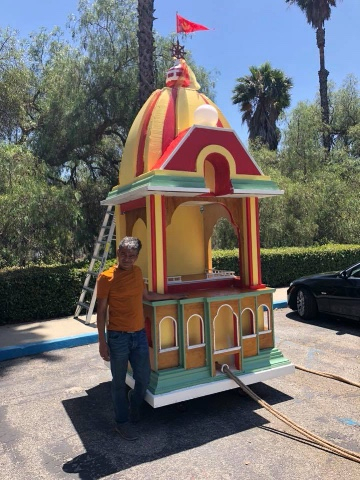 Our Pandal master Shubhendu (Chipli) Roy impressed us this weekend by building a rath (chariot) for the auspicious occasion. 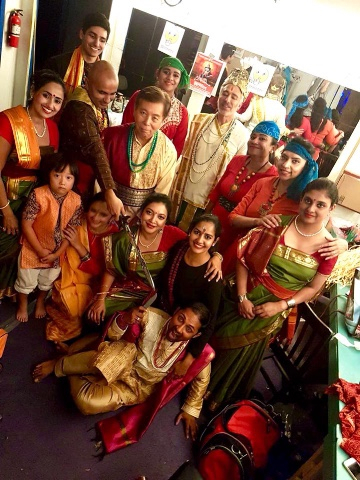 Two of our junior members, Proma Majumdar (vocals) and Prokkawn Majumdar (sarod), participated in the short cultural program as well. Sacrifice by Tagore had a stellar opening weekend in Hollywood featuring members like Rajasri Chakraborty (dance director), Koushik Chattopadhyay (actor), Siddhartha Dattagupta (voiceover), Sagnik Chakraborty (music mixing/editing) and dancers: Arpita Chakraborty, Bhaswati Moulik, Debapriya Bhattacharya, Ipsita Bhattacharya, Mohua Roy, Puspita Roy Chowdhury, Riyana Roy, and Simran Bhattacharya. Click here to buy tickets for any of the 3 remaining shows taking place next weekend. Also coming up this weekend on July 21st, is Music Mysticale (click for flyer) where our senior member/patron Mrs. Monidipa Sharma will be singing light classical with Dr. Tathagata Dasgupta (tabla) and David Trasoff (sarod). 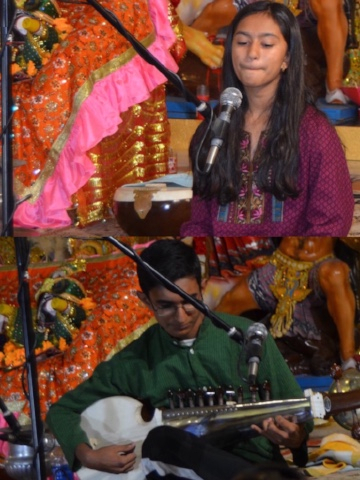 Junior member Niravroh (Surya) Laha will also be playing the sitar accompanied by Roddur Dasgupta on the tabla.